The Montgomery County Adult Probation, Parole and DUI Services Department has signed a full-building lease totaling 23,373 square feet at 408 Cherry St. in Norristown, PA. The three-story office building is located on 0.2 acres at the corner of W. Penn St. in the Norristown / Valley Forge submarket of Philadelphia, directly adjacent to the Montgomery County Courthouse and One Montgomery Plaza. The office was built in 1956 and completely renovated in 2005 to include a new roof, windows, HVAC, ADA-compliant bathrooms and an elevator. With a long-term lease with Vanguard Group secured and demand for creative office space high, the owner of 2300 Chestnut St. in Philadelphia has decided to put the building up for sale. When Paul V. Profeta bought the 103,905-square-foot building in May 1987, he paid $1.13 million for it and spent another $4 million on renovations that turned an industrial loft structure into multitenant office space and re-branded it the Philadelphia Design Building. The building has come a long way since and with Vanguard recently signing a 10-year lease on 16,000 square feet with options to expand, the building is now 100 percent occupied. Profeta believes the building could trade for as high as $30 million, or more than $290 a square foot, though it can be tricky to pin down what an investor will actually pay for the structure. What it does sell for will be telling for the investment market and whether buildings such as these—older, smaller but packed with tenants with a creative bent—will trade at a premium. While Vanguard is paying rents at $32 a square foot, most tenants are paying about 21 percent below market or about $22 a square foot, giving a buyer an opportunity to boost rents and net operating income as tenant leases come due. So goes NY so goes Philadelphia? Cotiviti leased 86,621 square feet in the office building at 785 Arbor Way in Blue Bell, PA. The tech firm will occupy the entire first floor of the three-story, 203,049-square-foot Woodlands I building. Originally built in 1970 on 26.7 acres in the Plymouth Meeting / Blue Bell submarket of Montgomery County, within Arborcrest Park, the asset is currently under renovation in an improvement program that began in 2015 and is expected to be completed in the first quarter of 2018. Cotiviti will take occupancy of its space once the renovations have been completed. Herman’s Warehousing has signed a 400,000-square-foot sublease at 8620 Congdon Hill Dr. in Alburtis, PA, through July 2017. The single-story, 1.2 million-square-foot, 5-Star industrial building delivered in October 2016 on Lot 5 in the Liberty Business Center II, within the Lehigh Valley Industrial submarket. The steel building features a 185-foot truck court, 84 loading docks and two drive-ins, 36-foot clear heights, a 600-foot building depth and up to 57-foot column spacing. Ryder Systems had pre-leased the entire building from Liberty Property Trust back in July 2016. After conducting a search that took it to various office buildings throughout Horsham, Telerx Inc. has signed a lease to relocate its headquarters around the corner from its current offices off Dresher Road. The company, a subsidiary of Merck & Co. Inc., signed an eight-year lease on roughly 45,000 square feet of space at 410 Horsham Road, an 88,045-square-foot building that is vacant and under redevelopment. Telerx has been based in the Horsham area for 20 years and, though it wanted to stay in the area, the company was ready for a change. It occupies 50,000 square feet at 723 Dresher Road and recently vacated 17,000 square feet at 100 Lakeside Drive. While the size of the Dresher Road building worked for the company, the space, more like a warehouse rather than an office, wasn’t meeting its needs. “We did consider staying there, but the cost to renovate would have been very high,” said Bud Herrmann, director at Telerx. A renovation would also be too disruptive to its business, Herrmann said. Telerx is a customer service call center operator that focuses on the health care industry. Since the company has been in Horsham for so long with its 400 local employees familiar with the commute, Telerx decided to focus on the area. It looked at a handful of buildings and selected 410 Horsham because of its location, sufficient parking and access to a bus route, Hermann said. The lease is a big one for the building, which has been vacant for years though its new ownership was intent on changing that status. PernaFrederick bought the property in the fall of 2015 from First Niagara Bank for $2.45 million and launched a gut renovation of it. Built in 1990, the property had been fully occupied for years by TNS and Morning Star only to become vacant and taken over by its lender. This is the first attempt by the duo to venture beyond being brokers and trying their hand at also being a landlord. AIM Academy paid $11.5 million to buy a 71,000-square-foot building on 4.5 acres at 1200 River Road in Conshohocken from Buccini-Pollin Group. AIM, a private school for students with language-based learning differences, moved into the building in 2012. The school was established in 2006 with 24 students and now has 312. The building houses its three divisions as well as administrative and other space. It recently constructed a 23,000-square-foot AIM Community Center on the site that has a full-size gym and stage space. Chester Hall, a 40-unit apartment property at 4205 Chester Ave. in the University City neighborhood of Philadelphia, has sold for $4.1 million. The buyer was a partnership between two limited liability corporations, 1118 Spruce St. and Greenzang Properties VII and the seller was an affiliate of Post Brothers, which paid $2 million for the property in 2015 as part of an acquisition of a larger portfolio of apartment buildings in the neighborhood. The Estate of Edna Ravikio sold a 48,000-square-foot office building at 505 S. Lenola Road in Moorestown, N.J., for $2.3 million to 505 S. Lenola Road LLC. The property was 90 percent occupied at the time of the sale. Wakanek Property Management paid $4.55 million for a partially occupied 109,000-square-foot building in the Byberry West Industrial Park at 2101 Hornig Road in Philadelphia. The seller was Fred Hill & Son Co.
Holliday Finoglio Fowler arranged a $25 million, 15-year loan to refinance the construction loan on Station at Manayunk, a 149-unit apartment complex at 1 Parker Road in the Philadelphia neighborhood of Manayunk. J.G. Petrucci Co. Inc. completed developing the multifamily community in 2015. The loan was arranged with Principal Real Estate Investors. The building that houses the famed Electric Factory, a popular concert venue that has been around for more than four decades, is up for sale and could possibly trade for around $17 million, according to estimates. The property sits in the Callowhill neighborhood of Philadelphia, which has increasingly been grabbing interest from investors and developers who have been buying buildings for conversions or moving forward with new construction. The area has also been referred to as Spring Arts and includes the Chinatown North section of the city. Regardless of the name, the renewed interest in the area is bring driven by several factors including the core of Center City stretching its boundaries and pushing northward, the availability of older industrial buildings ripe for redevelopment as well as the phased transformation of the Reading Viaduct into an elevated park. The Philadelphia Bar Association is proposing a more than $40 million project at 8th and Vine streets. Complementing these and other projects in the area is a continued march of development activity along the North Broad Street corridor. Interest in the area is expected to continue and reshape what had been one of the city's manufacturing centers. “The Callowhill neighborhood will continue to attract new residents and businesses with its funky blend of industrial/commercial/residential living and working opportunities,” said a 2013 Philadelphia Planning Commission analysis of the area. “Former industrial buildings and historic structures will be rehabilitated and new development will be integrated with the existing scale and historic industrial character of the neighborhood." While there is a dearth of green spaces in that neighborhood as a result of its industrial past, the Reading Viaduct elevated park is expected to fill a void of recreational space as well as encourage new development and attract additional 1,775 households and 340 jobs to the Callowhill neighborhood, the planning commission predicted. TEIR REIT, Inc. has sold its 60-percent interest in the Wanamaker Building at 100 Penn Sq. E in Philadelphia, PA through a reported divestiture of an interest in the entity that indirectly owns the asset for $114 million, or about $139 per square foot, to Rubenstein Partners LP. The partial interest transfer included the assumption of existing debt secured by the property and held by Tier REIT, which in a Q3-2016 public filing reported the balance due in 2023 with a stated interest rate of 3.83 percent. The balance was not disclosed. This historic property was built in 1902 with a renovation completed in 1991. It totals almost 1.37 million square feet, including 954,000 square feet of office space and 435,000 square feet of retail space, located on 2.7 acres in the Market Street East submarket. Macy's utilizes the entire retail portion with 10 years remaining on its master lease. Other notable tenants in the office portion, stabilized at around 97 percent occupancy, include The Children’s Hospital of Philadelphia and the U.S. Department of Housing and Urban Development. Tier REIT, which at one time had listed the entire asset for sale with an asking price of $210 million, is focusing on seven targeted growth markets, and Philadelphia is not one of them. Headquartered in Philadelphia, Rubenstein owns several area assets. To paraphrase Humphrey Bogart in Casablanca, when it comes to logistics hubs, we’ll always have Dallas. And Atlanta. And the Inland Empire. However, Colliers International’s Dwight Hotchkiss tells GlobeSt.com that up-and-coming markets will be seeing faster growth this year. The firm has identified 10 emerging markets that are likely to experience the most robust increases in demand from both occupiers and owners. Those 10 markets include Columbus, which had a record-breaking year in terms of new supply from construction; Denver, which saw the most product under construction in more than a decade; Phoenix, which ranked #9 for new supply; Greenville-Spartanburg, ranked #6 in the US for overall net absorption as a percent of inventory; Indianapolis, which ranked #6 nationally for overall net absorption; Kansas City, ranked #7 in the US for new supply; Memphis, with the lowest asking rental rate for a US market over 100 million square feet; Nashville, which enjoyed a record-breaking year for product under construction; Los Angeles, where leasing activity increased 4.8% between the third and fourth quarters of last year; the Shenandoah Valley, with a 6.6% overall vacancy rate; and Tampa Bay, ranked #10 in the US for overall net absorption. What kind of growth will these 10 growth markets see in 2017? “We just put something that has the top five 2016 year to date growth markets in terms of absorption as a percentage of inventory,” Hotchkiss says. “Charleston is on it, Savannah is on it and Reno is on it, and then Stockton and the San Joaquin Valley area are on it. The markets that we have on here as well all have seen significant absorption because of all these new uses or built-upon uses going into them. Home of the world’s largest media conglomerate, global center for education and medicine, and “ground zero” for specialized, high value-add, professional services firms in the region. And now, Downtown Philadelphia will finally facilitate the world’s largest mutual fund in its urban expansion. The effect of these “new economy” occupiers on Downtown Philadelphia’s office market is most evident in the demand for space in trophy office buildings, where nearly 95% of space was occupied before the FMC Tower was completed. The overall market, too, is historically about as tight as it gets with a vacancy rate of 11.0% in Q4 2016. For owners, it doesn't get much better than this. Nonetheless, with cranes in the air and new office buildings readying for completion, the dynamics are changing. Where do we go from here? Figure 1 below offers guidance to tenants, seeking some relief for more space, and owners, wondering how long the good times will last. In short, through the end of 2018, we see the market shifting more favorably towards tenants, but not by much. Key to this outlook is the belief that the economy will remain sound. In 2017, this market should remain as tight as ever. In 2018, with the completion of 3675 Market Street and 2400 Market Street, the space vacated by tenants moving to these buildings will likely be more than the amount of space leased, thus increasing the vacancy rate. Nonetheless, we don't see the pessimistic scenario becoming any worse unless the economy changes substantially. And if we don't see the vacancy rate rising above 13%, that's still a relatively tight market for space. At the other end of the spectrum, our optimistic scenario is somewhat muted, only assuming 240,000 sq. ft. gets absorbed each year (this equates to the average over the last five years). (3) a continued flight-to-quality space by tenants, making some of the less desirable, vacant office space increasingly obsolete and less influential as a drag on overall rents in the market. 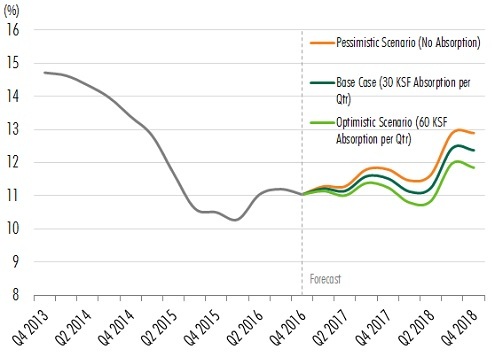 Of course, our certainty in these forecasts wanes the farther they stretch into the future, but we have a high degree of confidence in the local economy and are assuming no other significant completions by the end of 2018, or even in early 2019. The risks remain abundantly apparent, but are accounted for in our forecast. Besides economic growth, one of them relates to the outsized demand for space from co-working companies. Nearly 1/3 of all net absorption in Downtown Philadelphia since early 2015 was due to co-working spaces. The other risk relates to the unrelenting growth by Comcast. For now, our view is that both of these sources of growth are stable. A local juicery and café that first opened on Manayunk's Main Street will open their second location this year on the Main Line, taking over a space formerly housing a George Perrier-founded restaurant. Since it debuted in Manayunk in June 2014, The Juice Merchant has launched a vegan, gluten-free menu along with its cold-pressed juices. Now it's time to expand. A sister location will open in March this year in Narberth in Montgomery County, taking over the space vacated by Art of Bread, which George Perrier founded in 2011 and closed last year. The Manayunk location is about 1,700 square feet, while the Art of Bread space is around 2,500 square feet, most of which is in the bakery. The second outpost will have about 16 seats, according to a spokeswoman. The company also acquired and will introduce a juice truck, which the company will take on the road for public and private events. Vanguard will open a satellite office in 2300 Chestnut St. in Philadelphia. The mutual fund company, which will maintain its vast headquarters in Malvern, Pennsylvania, will occupy two floors at the building and start out with 20 employees in the space. Vanguard expects to eventually have 100 people working from 2300 Chestnut and even have “external partners” co-locate in the building with it. It expects to occupy the space during the second quarter. Known as the Philadelphia Design Building, the 100,000-square-foot historic structure has been marketed as creative office space. Among its tenants are Saxbys Coffee, which has its headquarters in the building, Lauletta Birnbaum, a New Jersey law firm that has a satellite office, as well as Running Press. A Maryland-based sports-themed bar and grill chain will finally open its first Pennsylvania restaurant in Montgomery County this year after inking a 10-unit deal for the Philadelphia region nearly two years ago. The Greene Turtle, a Columbia-based restaurant chain with a "Maryland flair" to its menu, in mid-2015 signed a 10-unit deal with franchisees operating under The Integrity Group name. The first of those restaurants is under construction now; it's a conversion of a former Uno Chicago Grill restaurant at 1100 Bethlehem Pike in North Wales in Montgomery County. The 6,500-square-foot, 248-seat Greene Turtle is halfway through its construction cycle, and it's expected to open sometime in April this year, according to Tom Finn, vice president of franchise development. The Greene Turtle, which first opened in 1976, has 45 restaurants open and operating, with another 51 in development contracts to come on the market in the New York metropolitan area down to the Washington, D.C., Virginia and Maryland region, Finn said. The company last year moved its headquarters from Hanover to Columbia, Maryland. The Festival Companies sold the Palmer Town Center at 500-821 S. 25th St. in Easton, PA for $31.75 million, or about $207 per square foot, to Phillips Edison & Company. Built in 2005 at the corner of Dearborn in Philadelphia's Lehigh/Northampton submarket, the shopping center totals 153,085 square feet and is anchored by Giant and Marshalls with inline space and outlots occupied by Papa John's Pizza, Aaron's, Dairy Queen and BB&T. A separately-owned Home Depot shadow anchors the center. Brandywine Realty Trust ended its year selling $860 million in properties — handily exceeding its original target of unloading $450 million — and reaching a leasing milestone at FMC Tower, which is now 96 percent occupied. These were among the updates the company provided Tuesday during a company conference call with analysts to discuss fourth quarter and year-end results. Greater Philadelphia isn’t the only region in the tri-state area with tech ambitions. Seed Development, a small software consultancy startup, is relocating its headquarters from New York to downtown Allentown, according to a Tuesday announcement. The move shows the Lehigh Valley's progress in its own quest to draw more tech companies into its midst. Matt Pavelko, Seed Development's CEO, said he felt that attraction. The Lehigh Valley native sees the region’s position north of Philadelphia and west of New York — in addition to the major higher education institutions in the area — as key elements to drawing in the talent the fast-growing firm wants. It also has rents far below New York’s, and a lower cost of living, but Pavelko said the cost efficiencies don’t mean they’ll be trimming wages. While Seed will maintain offices in New York and Charlotte, North Carolina, its new headquarters and bulk of its employees will be located in a 5,200 square-foot office with exposed brick, open space and high ceilings located in Allentown’s $400 million mixed-use development City Center Lehigh Valley. Officials credit the development with helping spur revitalization in the downtown area. The core of the 1 million square-foot City Center is a new arena, the PPL Center, that is surrounded by Class A office towers, the Velocity coworking space, apartments, retail shops, a hotel and upscale restaurant space. Brandywine Realty Trust has sold its 50-percent ownership interest in the 398-unit Parc at Plymouth Meeting apartments at 134 Plymouth Rd. in Plymouth Meeting, PA for $100.5 million, or about $505,000 per unit, to Toll Brothers Apartment Living. The 465,000-square-foot multifamily community consists of six buildings offering a mix of 330 one-bedroom and 68 two-bedroom units. The property was constructed in 2015 by Brandywine on 19.5 acres in Montgomery County. Nearly 10 years after a flood forced Chez Odette in New Hope to close its doors, the owners of the restaurant are reportedly preparing to put a boutique hotel on the property. Expected to open in 2018, the Riverhouse at Odette's will include three dozen guestrooms and suites, a rooftop bar and "an impressive open-concept ballroom that features floor-to-ceiling retractable glass walls that lead out to a sprawling veranda," according to the company website. Securing the use of the roughly half-acre of land that surrounds the building has allowed the development to move forward, Philly.com reported. The lease, signed two weeks ago with the Pennsylvania Department of Conservation and Natural Resources, grants use of the public lands to the hotel for 35 years, said Ron Gorodesky, managing director of the development project. A joint venture of Endurance Real Estate Group and Thackeray Partners is acquiring and repositioning 2000 Bishops Gate Boulevard, a 305,250-square-foot, class A industrial warehouse property in the suburban Philadelphia community of Mount Laurel, NJ. The partners acquired the property from Masahiko Morioka for an estimated $12 million. $10 million in financing was arranged through an institutional lender. Real Capital Analytics says the building is 100 percent leased to OKI Data Americas for a headquarters and distribution center, but HFF says the new owners expect to reconfigure the property, reducing the office space and increasing warehouse space to meet the immediate market demand for class A bulk distribution warehouse space in southern New Jersey. Situated on 43.48 acres, the building is located within the 1.45 million-square-foot, master-planned Bishops Gate Corporate Center at the intersection of Route 38 and Interstate 295 (near the New Jersey Turnpike), which provides access to central and northern New Jersey. The property, which is part of the South Burlington County Industrial submarket, is in the “3M” area of Marlton, Mount Laurel and Moorestown approximately 20 miles east of downtown Philadelphia. The 2000 Bishops Gate Boulevard building is currently available for lease and has a 30’ clear height, 55’ by 50’ column spacing and 25 loading docks with one compactor door and two drive-in doors. Equus Capital Partners will move its Philadelphia area executive offices in 2018 to a new 42,000 square-foot headquarters building to be located at its Ellis Preserve development, a 218-acre master planned mixed use community located in Newtown Square, PA. Ellis Preserve is owned by Equus affiliates and has been in various phases of development since 2004. Construction on the new Equus headquarters will begin this spring. In moving to Ellis Preserve, Equus wants its staff of real estate professionals to experience first-hand the unique Ellis Preserve environment, the convenient amenities provided by the Ellis Preserve retail stores, fitness center and restaurants, as well as the vibrant residential growth underway on site. Located at Routes 3 and 252, Ellis Preserve currently contains 975,000 square feet of office space, which is 99 percent occupied, as well as a new, 100-percent leased 110,000 square foot retail center anchored by Whole Foods. Construction is currently underway at the site for a 138 room Hilton Garden Inn, a 252-unit mid-rise multifamily community to be known as Madison at Ellis Preserve, and 66 for-sale townhomes. In addition, Toll Brothers recently acquired land at the site and will develop 76 carriage-style townhomes. The site adjoins the 100 acre, 650,000 square foot North American headquarters of SAP America. Iron Hill Brewery has plans to open a new brewpub at the East Market development under construction at 11th and Market streets in Philadelphia. The restaurant signed a long-term lease on roughly 8,500 square feet of space that will seat 250 people, have semi-private dining rooms and breakout rooms, as well as an outdoor dining area. Iron Hill will join Wawa, Design Within Reach and Mom’s Organic Market as tenants in the mixed-use project that has 130,000 square feet of retail space, 175,000 square feet of office space and 322 apartments in its first phase. The restaurant will be the thirteenth for Iron Hill, which has a presence in Philadelphia’s Chestnut Hill neighborhood. Kevin Finn, president and founder of Iron Hill, said that for the last few years he has been frequently trekking to Philadelphia with his two teenage daughters to visit museums, coffee shops, boutiques and other stores, and took note of all of the activity underway in the city. When it decides to open up a new restaurant, Iron Hill seeks to be part of the community in which it locates. “That is one of the reasons when we came to Philadelphia, we went to Chestnut Hill,” Finn said. Finn believes that the East Market project and burgeoning area of Philadelphia will allow Iron Hill to be part of a neighborhood that is on the upswing. It will initially employ about 100 people. Street Sense, a design firm based in Bethesda, Maryland, and Washington, D.C., will design the space. The economic landscape is rapidly changing, creating a new demand for commercial property in smaller suburban cities. Rapidly increasing property values in major cities are causing large traditional companies and start-ups alike to move out of metropolitan areas and into the suburbs. However, in many cases, these smaller towns aren’t prepared for the impact of the new businesses. In California, small towns are being developed into larger suburban cities, and it’s spreading. Similar trends are emerging around the country including in Oregon, Washington, Texas, and North Carolina. As the demand for space in these hot areas exceeds the available land, commercial real estate professionals must serve traditional real estate needs and creatively repurpose overlooked spaces for new development. Are you ready to meet these new real estate needs? Do you know your neighborhood? In some of California’s small historic towns, the demand for land and the desire for quant suburban living has had to cope with finite space and historical preservation initiatives. Developers have had to get creative with nontraditional spaces to create unique and vibrant experiences for consumers. Real estate developers and business owners are defying conventional notions of value by occupying small misshaped lots, creating successful businesses out of what would otherwise have been wasted space. In these towns, it’s common to see people shopping and dining at what was once a back room, a parking space, or even an alleyway. These spaces are not only cheap; they also create a unique ambiance. Developers are working with cities seeking to revitalize downtowns to support their growing populations, while preserving the historical atmosphere. Alleyways are being converted to public seating areas to support local food vendors, abandoned rail lines are developed into safe walking/biking trails, and small “parklets” are being built in parking spaces to provide more room for pedestrians in impacted downtowns. I work in a medium-sized city an hour outside of Los Angeles. What makes this town unique is that when the housing boom of the 80s and 90s hit the area, several private citrus grove owners on the fringe of the city limits sold their properties to developers for housing and outdoor lifestyle centers. However, within the downtown area, the number of new construction projects remained low. This initially prevented new businesses from entering the market, and local residents took their business to neighboring cities. Recently, a group of creative developers began seeing hidden opportunities with the help of spatial statistics. I worked with one of the developers last month, and I asked what it was like working in such a unique environment. She told me that the main challenge is convincing investors that their particular business or industry will be successful, and that she cannot rely on intuition alone to answer their questions. As we talked, she explained that many of her colleagues put too much emphasis on conventional wisdom and historic trends, without looking at the bigger picture or the changing consumer base. I learned that software like Esri’s Business Analyst Online enabled her to see the surrounding area’s cultural trends and economic indicators. Because of this software, she can find an odd location, like an alleyway or 10-foot-by-50-foot lot, and justify why its valuable to a potential investor, buyer, or tenant. Rubenstein Partners LP announced the final closing of Rubenstein Properties Fund III. The discretionary real estate private equity fund raised a total of $565 million in capital commitments from a diverse group of investors, including some of the nation's preeminent public and private pension funds, university endowments and family offices. Fund III seeks value-added office property investments in markets throughout the Eastern US. In the past year, Rubenstein Partners LP has made six investments in a total of 39 office and mixed-use properties totaling $786.5 million. The office square footage has been being acquired for an average of about $115/square foot. The properties are located in the Indianapolis, Philadelphia, Washington DC, and Atlanta markets. Fund III fundraising surpassed Rubenstein’s two previous funds. Rubenstein Properties Fund II, L.P. launched in 2012 and raised $515 million of equity commitments. Rubenstein Properties Fund, L.P. launched in 2005 and raised $475 million of equity commitments. Pantzer Properties Inc. held final closing of its third real estate fund, the Panco Strategic Real Estate Fund III, with $305 million of capital commitments, exceeding its $300 million fundraising target. Commitments to Fund III and affiliated entities total $357 million when combined with $52 million of Fund III co-investment capital raised to date. A significant number of investors in prior funds made new commitments, while Pantzer attracted many new investors as well. Capital commitments were sourced from institutional investors, family offices and high net worth individuals. Fund III continues the firm's established focus of investing primarily in the multifamily sector on the East Coast. In the past year, New York City-based Pantzer Properties has acquired two Maryland apartment properties for a $145 million; two in Pennsylvania for $117 million; and one in Virginia for $69.25 million. The buys total 1,646 units representing a purchase price of $189,337/unit. Finmarc Management, Inc. sold the Penn Medicine Cherry Hill medical office building at 1865 Marlton Pike E in Cherry Hill, NJ for $81.77 million, or about $527 per square foot, to LaSalle Investment Management. The single-story, 155,308-square-foot, 4-Star office property delivered in October 2016 on 18.7 acres in the South Camden County submarket of Philadelphia, southeast of the I-295 interchange. Penn Medicine occupies the entire building under a new 20-year, triple-net lease guaranteed by the University of Pennsylvania. Goldman Sachs Group, Inc. acquired the Valley Forge Distribution Center at 125 Green Tree Rd. in Phoenixville, PA for $54 million, or about $67 per square foot, from Colony Realty Partners. The 801,106-square-foot industrial building is fully leased to three credit tenants - Essendent, Haines and PODS - with a weighted average lease term of over 8.6 years. Investment sales activity was robust in both the CBD and suburban office markets while vacancy rates in the suburbs hit historic lows in 2016, the fourth-quarter 2016 Office Market report. The overall vacancy rate is expected to continue to rise in early 2017, with two sizable renovation projects scheduled to deliver in the second quarter. One Franklin Tower, GlaxoSmithKline’s former headquarters, and the former Family Court building at 34 South 11th Street will add a combined nearly 300,000 square feet of redeveloped office space to the market. Average asking rental rates increased by 7.2% over the past year to $30.08 per square foot, the highest in the Philadelphia CBD’s history. There was also an increase in investment sales activity, which rose 7.9% in 2016. Two Liberty Place, acquired by Coretrust Capital for $207.9 million, was the biggest office-building sale in 2016. Leasing activity totaled 2.2 million square feet in 2016, a drop of 4.8% from 2015. Aramark inked the largest lease of the year for 297,800 square feet at 2400 Market Street. Other notable leases in the CBD submarket included Five Below taking 180,000 square feet at 701 Market Street, and GSA leasing 94,704 square feet at 801 Market Street. In addition, Nasdaq leased 75,000 square feet at the FMC Tower at Cira Centre South, and Montgomery, McCracken, Walker and Rhoads took 67,000 square feet at 1735 Market Street. In the Philadelphia suburbs, space reached its tightest levels in more than 15 years. Class A direct asking rental rates increased 0.5% from a year ago to $25.63 per square foot. Overall net absorption was positive for the year, rising to 1.9 million square feet compared to 558,526 square feet in 2015. The King of Prussia submarket accounted for nearly 40.0% of the 3.2 million square feet of new leasing activity in 2016. Significant leases included Vertex, which leased 168,000 square feet at 2301 Renaissance Boulevard in King of Prussia; The Hartford Mutual Funds, which took occupancy of 73,189 square feet at 690 Lee Road in Wayne; and Teva Pharmaceuticals, which leased 60,307 square feet at Two Quarry Ridge in Malvern. Voya Insurance and Annuity Company renewing for 100,000 square feet at 1475 Dunwoody Drive in Exton. Franklin Mint Federal Credit Union taking 52,000 square feet at 5 Hillman Drive in Chadds Ford. Ashfield Healthcare leasing 82,000 square feet at 1100 Virginia Drive in Fort Washington. Linde Engineering North America renewing for 60,103 square feet at 325 Sentry Parkway East in Blue Bell. inVentiv Health renewing for 51,320 square feet at 100 Brandywine Boulevard in Newtown. 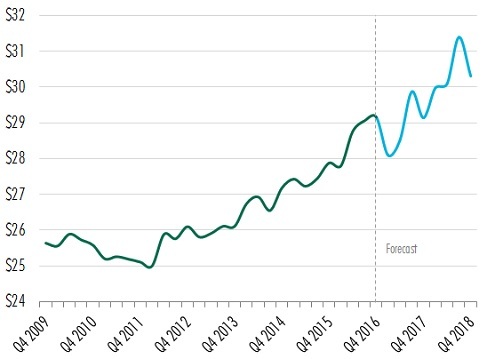 Investment sales activity, which rose 3.1% year-over-year, has increased significantly over the past two years and is expected to remain robust into 2017. A total of 9.7 million square feet has been sold since 2015, which is 49.4% higher than the total volume from 2010 to 2014. With the steep decline in vacancy and rising tenant demand experienced over the past year, new construction activity is expected to increase in 2017. The overall vacancy rate is projected to drop further next year, with rental rates for all classes rising by 5.8% by year-end 2017. A Berks County-based chip-maker is crunching the plans for a major expansion. Dieffenbach's, headquartered in Tulpehocken Township, announced Monday its plans to build a 188,000-square-foot potato chip manufacturing facility and warehouse in Bethel Township. Phase-one of the project calls for moving the company's logistics operation from a leased site to the new location, which will serve as the hub for staging domestic and international shipments, as well as direct store delivery operations, according to Mike Marlowe, Dieffenbach's chief operating officer. The second phase will allow for up to 20 new manufacturing lines, which would employ more than 100 additional people across four shifts, Marlowe said. Dieffenbach's, a third-generation family-owned business that was founded in 1964, said the project is still in the planning stages, so it's unclear when construction will start. "We are excited about the growth we’ve seen over the past several years, and thus have been taking the steps to allow for continued growth to service our customers, and provide additional opportunities for our employees to grow," Marlowe said. The new site will allow Dieffenbach's to double its current capacity when phase-one is complete and add an additional 100-percent once phase-two is finished. In addition to the Dieffenbach's brand of potato chips, the company owns and distributes two other brands, the most recent of which was launched in December. The Uglies brand focuses on reducing waste for farmers by using potatoes that have minor imperfections. The One Potato Two Potato brand was launched in 2012 and is sold nationally and internationally, including in Starbucks stores in North America. The company said it is also a leader in the private label manufacturing industry. "We currently make more than 100 unique products for various companies across the U.S. and Europe," Marlowe said. "We pride ourselves in being an indispensable partner for the private label companies we represent." The King of Prussia Town Center, a newly developed retail destination that counts Nordstrom Rack, REI, Ulta and Davio’s Northern Italian Steakhouse among its tenants, is up for sale. The 263,423-square-foot center was developed by JBG Cos. and what is now known as Williard Retail, a company formed last year by former veterans of JBG Rosenfeld Retail, a management and leasing division bought by JBG Cos. A segment of the company that remained was transformed into Willard Retail. The property is 84 percent leased, according to marketing materials from East Dil Secured, which has the listing. Among its other tenants are L.A. Fitness, Fogo de Chao, City Works and several fast-casual restaurants such as Naf Naf Grill and Honey Grow. A representative from East Dil declined to comment. JBG’s leasing strategy involved assembling a compelling group of tenants that provide high-quality dining and shopping opportunities in a town center setting that would be a unique destination in the suburbs. Placemaking, or creating an environment where people want to visit and linger for a period of time, is a big part of its approach. To that end, there are fire pits, seating, and organized events at the project. “If you think about the bigger picture of what is going on around this project, we wanted to assemble retailers that give people a lot of reasons to come to the King of Prussia Town Center,” said Tom Sebastian, senior vice president of development at JBG, in an interview last year with the Philadelphia Business Journal. Neither Sebastian nor a JBG spokesman could be reached for immediate comment.